Serving this veggie turkey to my guests was a revelation to me. T hey not only loved it, they didn’t wine about or miss the Turkey. I got rave reviews, what a ah ha moment! I hope you can take the time to make this treat for your family on the Holidays. Let me know the reactions you get from your family. All of the scrapped insides from the squash, eggplant and zucchini. 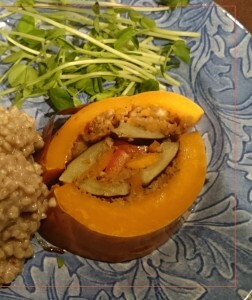 Kitchen implements needed: cutting board, melon baller, med size-mixing bowel, high side frying pan, Natural hemp string, Pyrex low side pan or cook sheet to fit the squash, a friend to help you hold the squash together and tie with string. 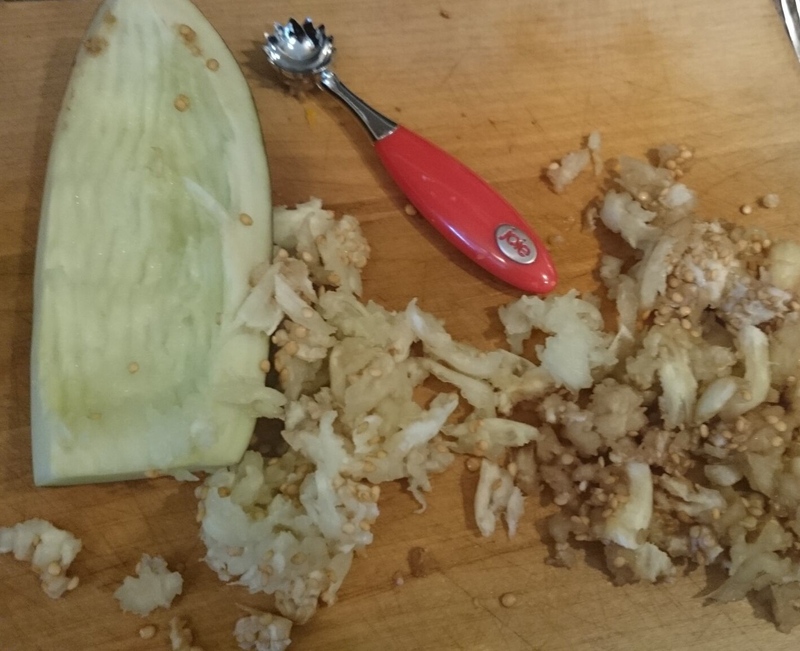 Take out a cutting board, a melon baller and a med size-mixing bowel. Cut all the vegetables listed above in half. Scoop out the seeds inside the squash, then scoop out the squash meat into a mixing bowel. Do the same to the eggplant and zucchini. Clean the red pepper and set aside. Next you want to make the dressing. Heat the fry pan with your choice of oil. Add all the spices into the oil, stir for ½ min, then add vegetable scrapings and stir. Let simmer for a couple of mins then add the ground walnuts. Stir and add the maple syrup and Braggs liquid seasoning to taste. Cover with lid and simmer for 10 mins. Pre heat oven to 400 deg. Get out a Pyrex pan and set aside. 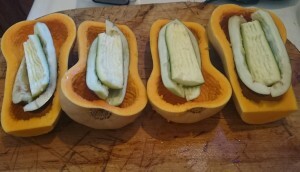 squash and spread thin and to the sides. Next take the eggplant if you squash is large enough, omit if your squash is too small. Then add more stuffing and place the zucchini on top. Make sure you press the stuffing around the vegetables as they are added. On top of all of the pile of veggie add a small slice of red pepper. Next you will need some string to hold the squash together. Get your friend to help you tie the string around the squash. 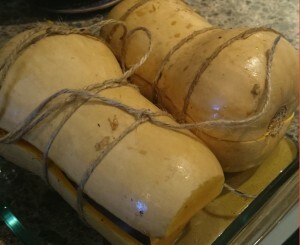 Put both si des of the squash together and using all four hands and tying the string around the squash. 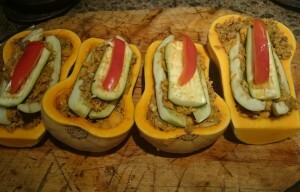 Place the stuffed squash in the oven lightly covered with tin foil, then uncover for the last half hour. Bake for 90 min. in the oven. Test for tenderness with a fork and bake longer if needed. When you serve this dish. Let it cool for 10 min before slicing. Then slice and place right on each person’s plate. You will see how beautiful this makes your holiday plating. Enjoy the rave reviews from your holiday guests. No one will miss the Turkey. This dish is way taster. Serve with salad and all the holiday dinner treats your family loves. Want to move away from Pop/Soda and lose weight?